West Indies' captain Jason Holder celebrates the dismissal of England's James Anderson. “It was definitely a bowler friendly surface. I wouldn’t say it was a fair contest between bat and ball but both sides have played on it and they’ve managed better in certain areas better than us. 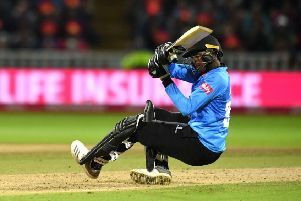 will indulge in any so-called ‘naughty boy nets’ - the contest resumes in St Lucia, where the only prize available is the avoidance of a clean sweep.